A sinkhole opened up later, right where all those people were standing. Reader Dave Dennison points out that the sinkhole was due to a broken water main, and at least 40 people drowned. Here’s the 1899 Sanborn map of Valencia between 18th and 19th. You can see the two big water mains, 22″ and 16″, running down Valencia. Another view of the sinkhole – you can see the water mains. The steeple in the first two shots aren’t visible in the picture below, or in the sinkhole shot. There was a 5.0 aftershock at 2:25pm on the 18th. Did it come down in the aftershock or during the rescue attempts? More on the Valencia St Hotel here. The “18th St Gulch” (for the lack of a better term — feel free to come up with a catchier name) was bigger than I realized. This sketch of the Mission from the 1850 looks NE from around 21st and Liberty and gives some indication of its depth. Zooming in on the bottom right, we see the gulch at what will be Dolores and 18th, with a stagecoach hurtling out of control (ok, probably not, as it’s not even the steepest part). I traced the topology contour lines from the 1859 US Coast Survey Map and made quick and dirty overlays to show just how much was filled in before the 1906 quake. Each color gradient is a 20 foot change. 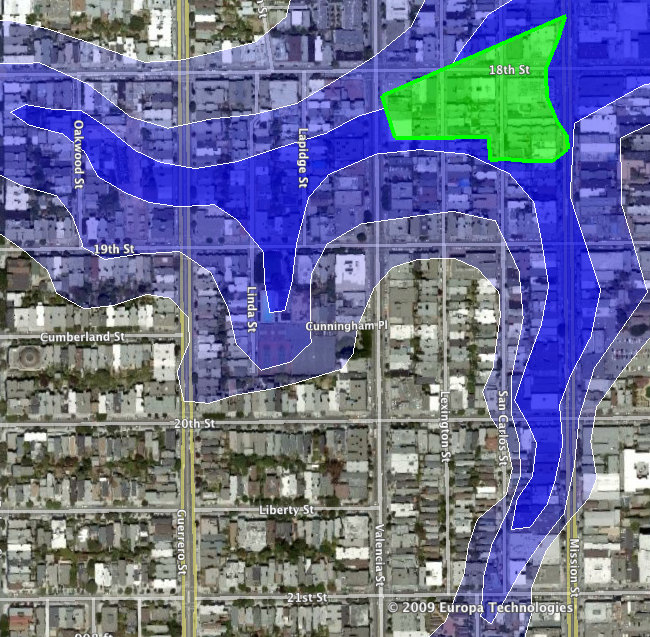 Note also the gulley along the west side of mission between 21st and 18th, as well as between Lapidge and Linda. Here’s the overlay of the Valencia St Hotel on the gulch map. (Valencia on the right, Guerrero on the left). Click to zoom. Zooming in on the left we see the steep ascent above Mission Creek, with the Willows in front of the trees. The road in front of the Willows is what will be Mission Street. (via Calisphere). Here’s the 1859 US Coast Survey Map. The building on the bottom left of the map (and the top center of the lithograph) may be the Jewish Cemetery. If so, Dolores Park would be to the right on the lithograph. The background of this picture of the Willows in the 1864 taken from the Union Race Course (via SFPL) gives some indication of the slope. I leave it as an exercise to the reader to determine where not to buy a house (or invest in a sound foundation). Damn. This is great. I don’t even know why I bother blogging anymore. 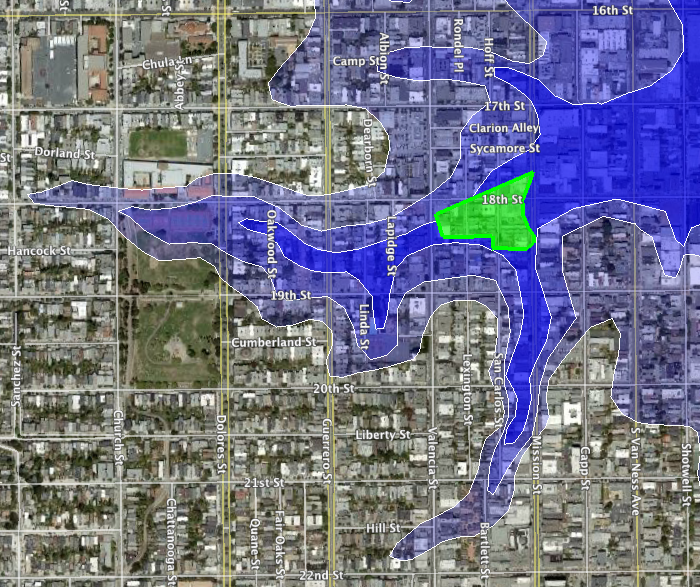 I recommend Googling “liquefaction zone san francisco” for lots more interesting maps and reading. I had to sign forms acknowledging I was in an earthquake liquefaction zone before I could buy my condo, they definitely take it seriously. This article is all your fault, KevMo. My wife is mad at you because I’ve been writing it all damn day. I love this blog! 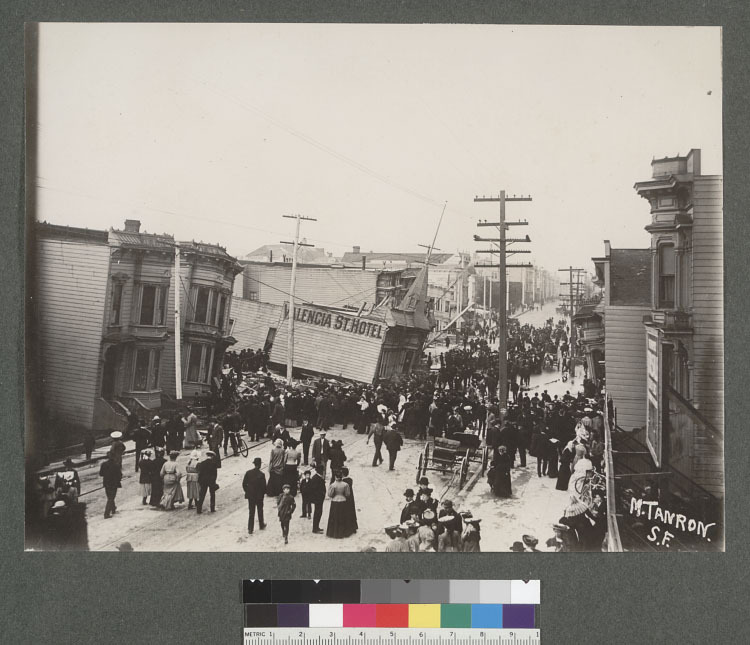 Actually, I think the steeple and the other boards that came off the Valencia Street Hotel were a result of rescue efforts on those trapped inside. It’s chilling that a two four-story buildings have just gone up on that block. Wha? All those photos with the Valencia St Hotel on the left are looking north? I’ll be damned, all these years I always thought it was looking south. So it was on the west side of the street. 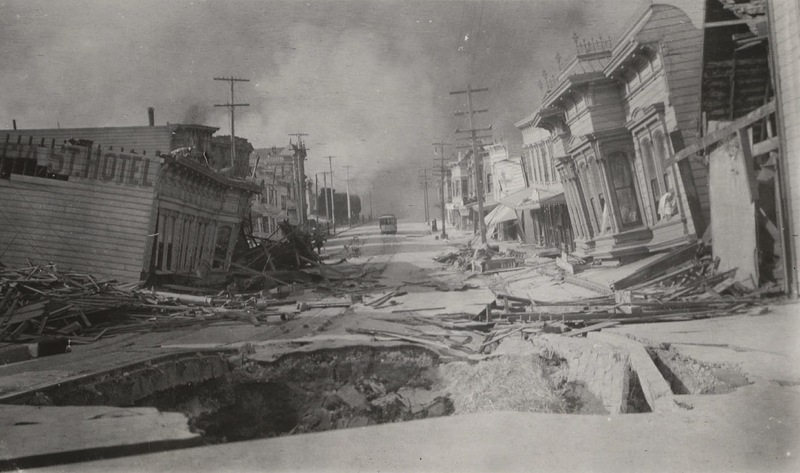 Added pre-quake Sanborn maps of Valencia. JohnnyO, thank you. One tiny bit of trivia: I always knew that the Valencia was on the left side if you’re facing North. Why? Because many moons ago a friend called from Daly City in desperation — his clutch had burned out on his van, he was broke and stranded. Could we help? Well I had just moved into the Mission and needed a lot of help around the house, so I told him that I would replace his clutch if he would just do something about my back yard. We took his van to a brake & clutch place that sat atop what had been the Valencia Hotel, and I guess is now those condos. In the customer waiting area, the walls were adorned with many, many disturbing but riveting photo’s of the scene circa 1906. The owner explained it all and from that moment on I knew that “displacement” in the Mission was actually a soil reference — for anyone but the trustafarians. The brake and clutch place on the hotel site is still there, with a sign on the outside warning that it’s an unreinforced masonry building and will be unsafe in a major earthquake. The new condos are next door. 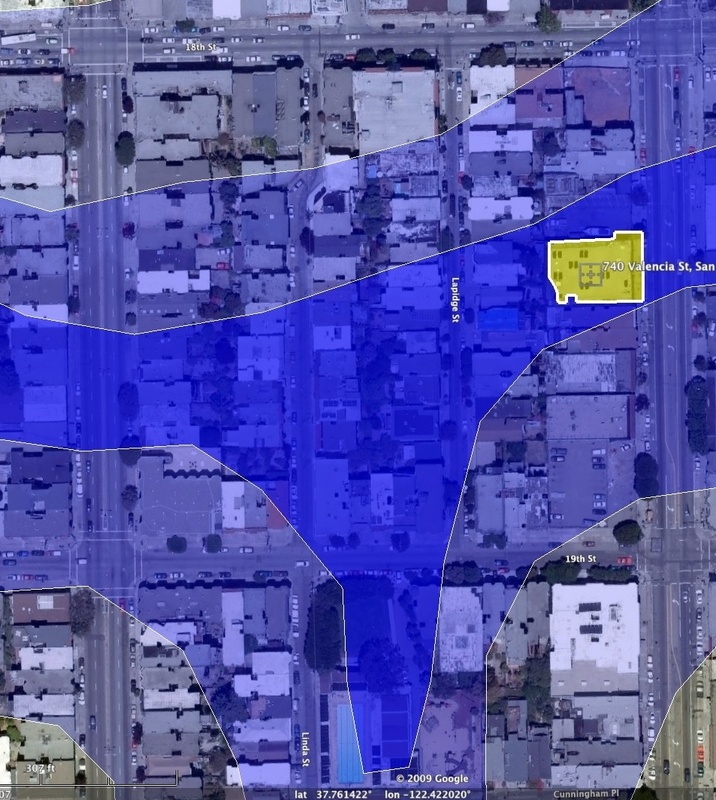 Added the location of the Valencia St Hotel to the gulch map. Another hour happily spent poring over a new BurritoJustice post. Thank you so much for this! CG: I’m glad the recent builders did something about the drainage. I think the only way to deal with stability is to sink pilings through the fill, sand and what not to solid rock/soil. I’m not sure they did that (I don’t remember hearing any clanging). You’re certainly right that there are a plethora of other buildings to be more concerned about. Johnny O, thanks for the additional info. 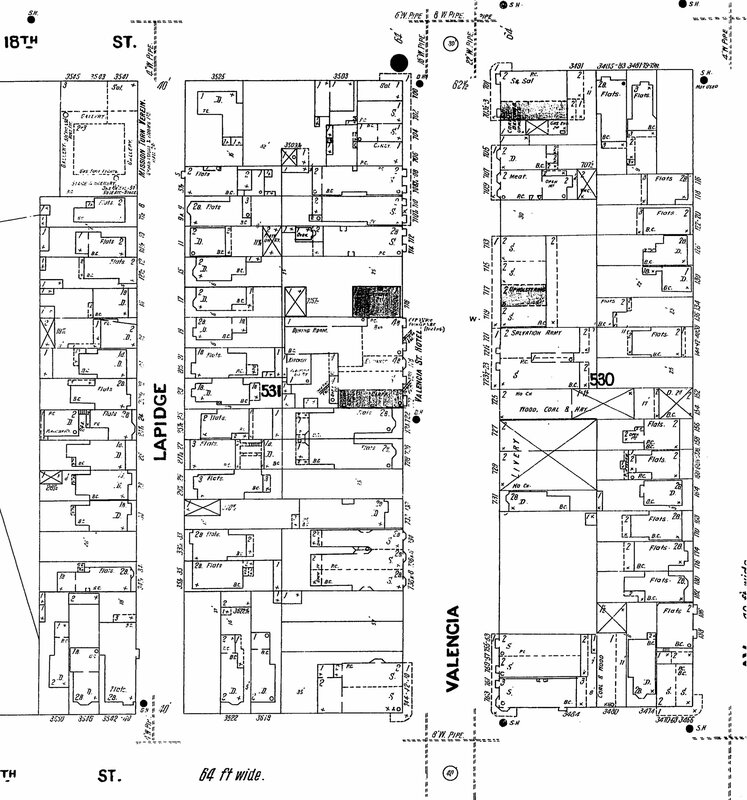 I’ve always assumed it was on the west side of the street, but could never find a map with the Valencia St Hotel on it. The photos I’ve seen of it give various street numbers. I finally checked an SF directory from 1899 and it’s listed as on the above map: 718,720 and 722 Valencia St.
718/720/722 also matches up with the Sanborn map (it’s kind of hard to see but the 716 and 724 on each side are more clear). But like a lot of places in the city, they changed the address order/frequency after they rebuilt in 1906, which is why that lot is 740 today. I didn’t know about the address changes post-1906. That’s great info! 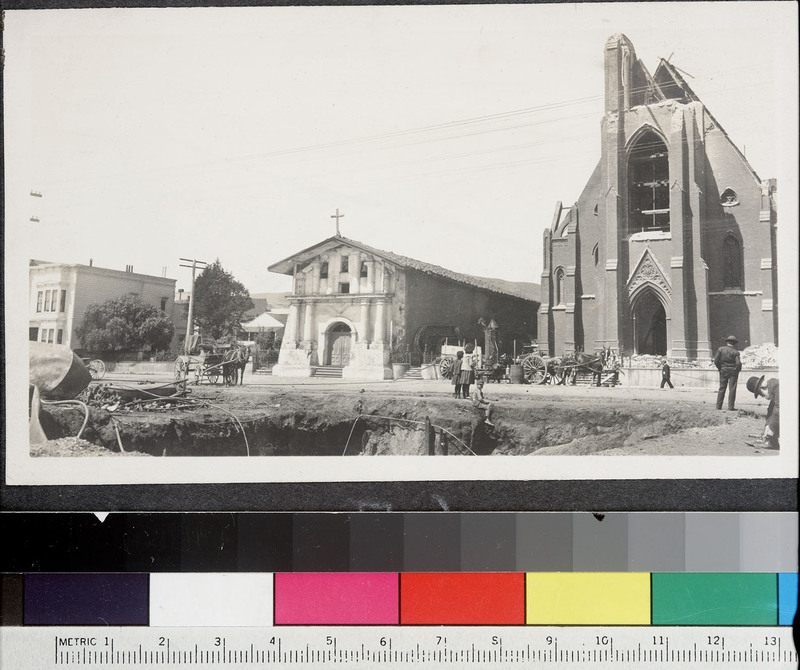 Speaking of sinkholes, I’ve seen a picture of one that opened in front of Mission Dolores in 1906. I don’t know the story on this one, but I’m assuming it’s a broken water main as well. 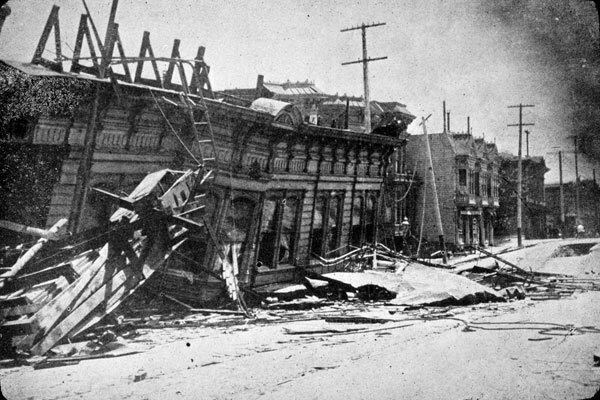 My guess would be that the steeple on the Valencia Street Hotel didn’t come down via the aftershock. It seemed firmly attached to the collapsed building and since it’s wood, could easily withstand a 5.0 shock. Wow !! Burrito Justice rocks !! I just discovered this corner of the online Chronicle (from a link by the article on the 8th & Division water-main break) and am so delighted. 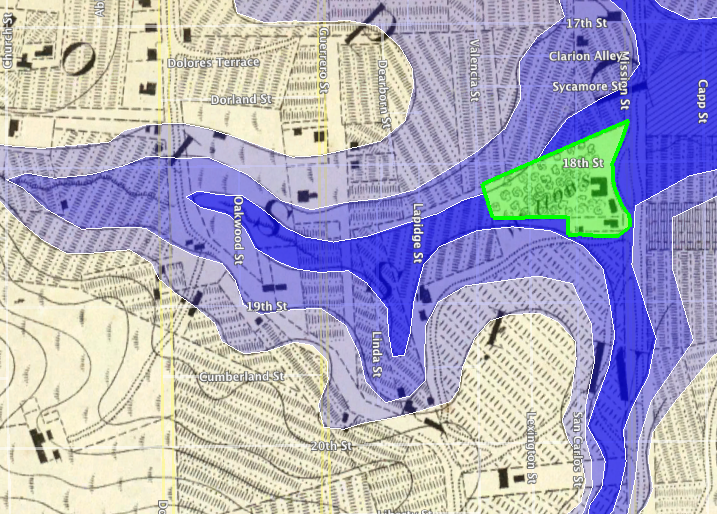 What a VERY superb report on the old creeks and lagoons throughout the Mission, now smoothed over with artificial fill. It is chilling to think, as others have commented, that many fairly high-rise structures are now being constructed on this delicate geology. Have our less-than-brilliant S.F. Planning & Building Dept.s been insisting on pylons that anchor these new buildings past the weak fill or other special foundation systems so that the unfortunate occupants can survive another 1906 ?? 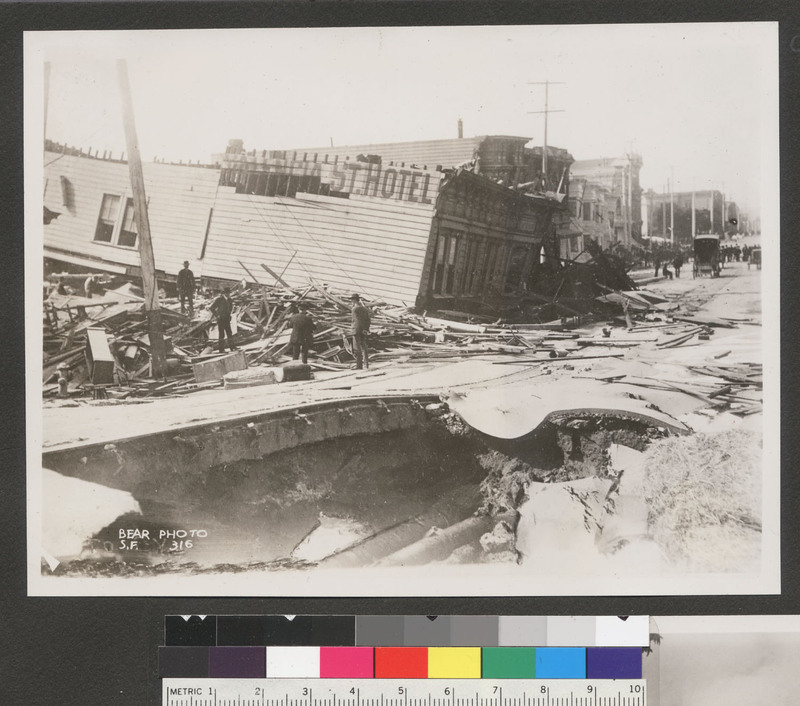 The big water-main sinkhole that just broke on the 200 block of Brannan (complete with 100 year old pipes the news said) sure looks identical to the 1906 sinkhole on Valencia !!! you might have died in that building, BJ………..now you are back to warn others….